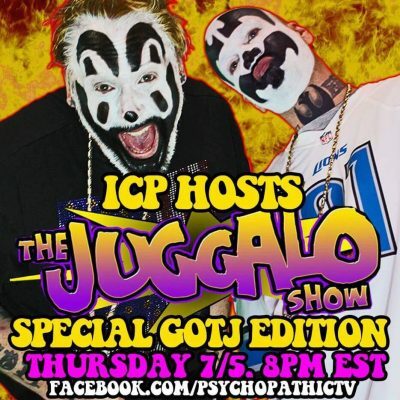 Violent J and Shaggy 2 Dope will be host a special Gathering of the Juggalos edition of The Juggalo Show. They will be joined by Jumpsteady, Rude Boy and Kevin Gill. It’s going down this Thursday, July 5th, starting at 8pm est. It will be live on Facebook.com/psychopathictv. ‪Hosted by Violent J and Shaggy 2 Dope!!! with special guests Jumpsteady,Rudy Hill& ya boyKG KEVIN GILLTHIS THURSDAY NIGHT! ‪#Whoopstock‬aka the Gathering Of The Juggalos!! !